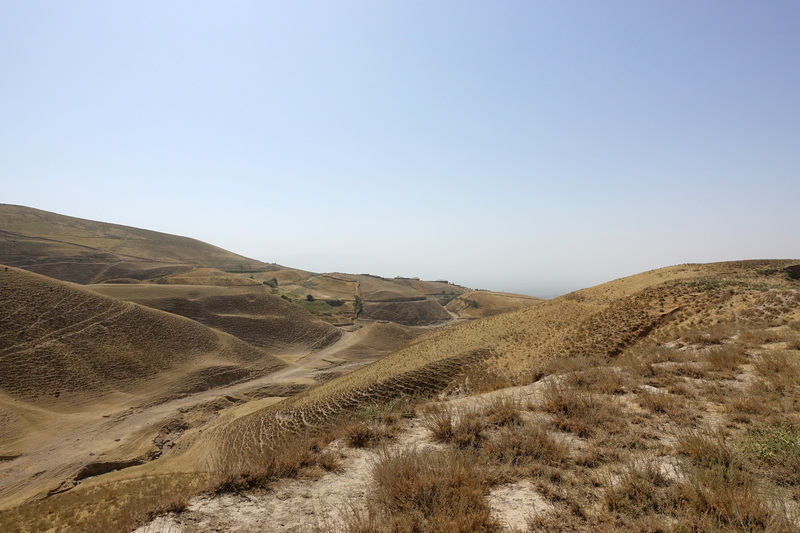 About 30 kilometers outside of Qalai Khum, in the hot afternoon sun, we found a guesthouse in the small village of Yoged and were looking forward to showering our dusty bodies. 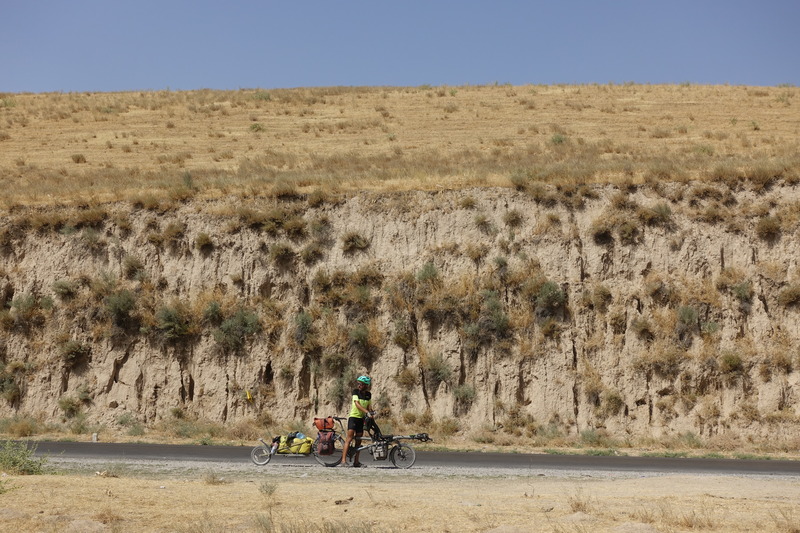 The road along the Afghan border between Khorog and Yoged is only partially asphalted, so dirt was constantly kicked up by passing cars and trucks. Our overnight spots in the past few days provided no (bucket) showers so dust was accumulating in every single crevasse. In the evening, we were served a paltry dinner of fried potatoes and bread – which is definitely not enough carbs for two cyclists. This guesthouse also featured a wonderful toilet across the street where the village’s irrigation canal terminus (before it entered the Panj river) did double-duty to flush any human refuse away (and onto the river bank just behind). Just another reminder to cyclists for finding any other water source besides the main river! 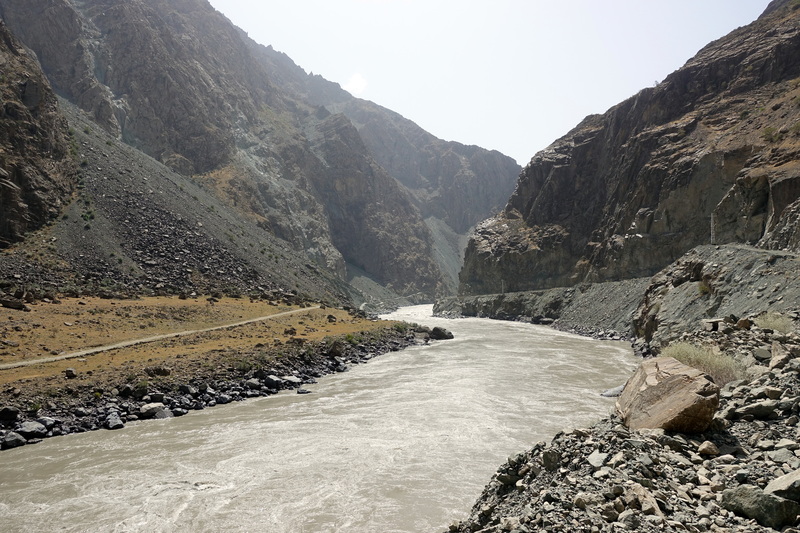 The Panj river (main tributary of the more famous Amu Darya river), not so inviting for a swim, eh? The next day, we continued our way down the smooth tarmac. 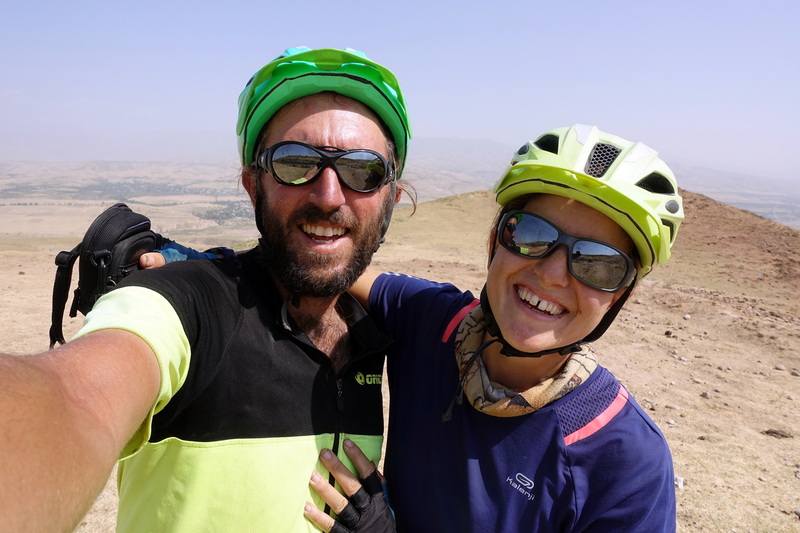 Finally, since Khorog (or even before), Cédric and I were no longer preoccupied by avoiding potholes and deep cracks in the asphalt – so we could absorb the rest of the Panj river valley views. Not too long into the morning, we were passed by a few pickup trucks with four masked guys and a machine gun in the back. That’s strange, I thought, this is the first time I’m seeing any Ford car in Central Asia (the trucks were Rangers). By the time the second truck passed, we could make out the word ‘police’ written on the side. A few minutes later, a black Humvee (again with a machine gun attached to the top) blew pass with an Afghan flag attached to the back. 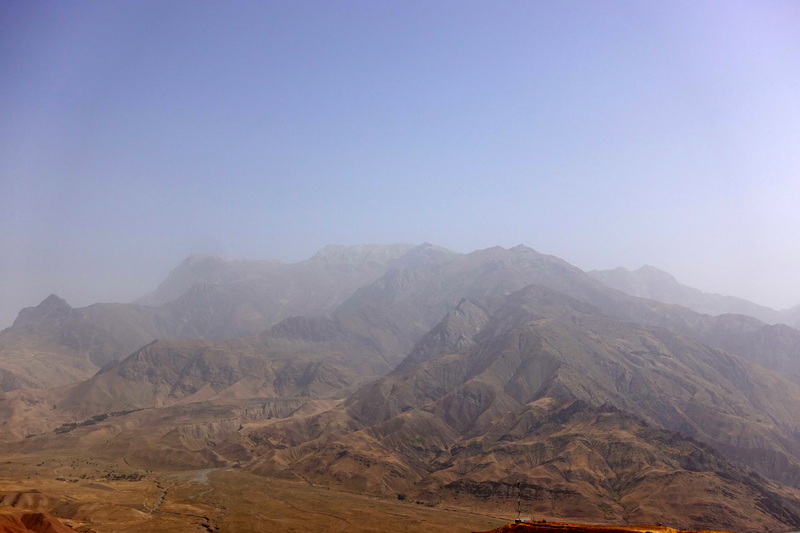 For a few surreal seconds, Cédric and I were wondering if the Afghan army had invaded Tajikistan. 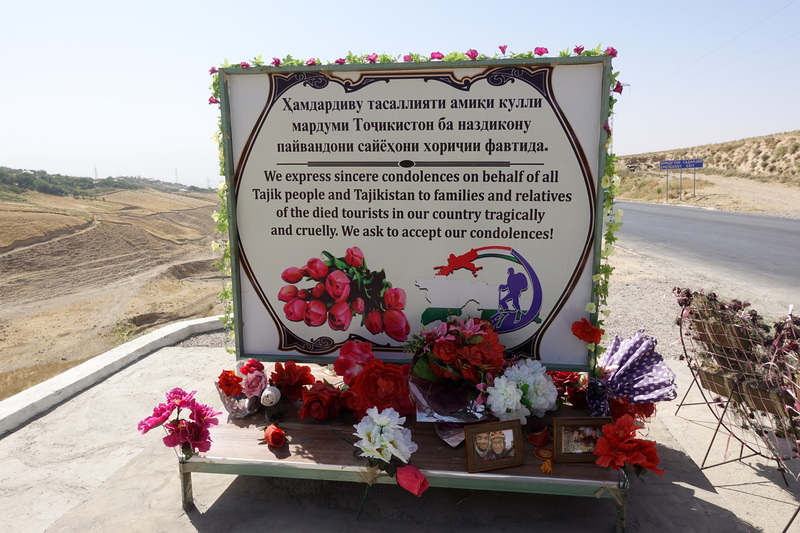 Then, looking across the river and seeing the tragic state of the Afghan dirt ‘road,’ we figured that they too were taking advantage of the smooth asphalt (and relative safety) of the Tajik roads. 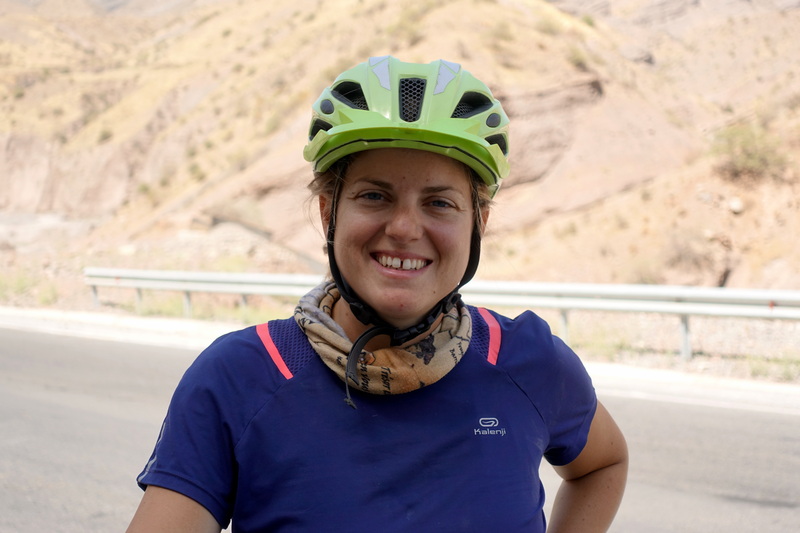 For the rest of the day, as we were cycling through the hazy canyon, we had many Tajik military caravans also pass us, gleefully honking at us cyclists as they drove by. We figured that something was going on but didn’t know what. Towards the end of the day, a Bosnian guy working for a Norwegian NGO in Tajikistan stopped to give us a few bottles of water and also mentioned that it was weird to see such an elevated military presence. A part of the road washed out – so we’re not entirely on good roads yet! 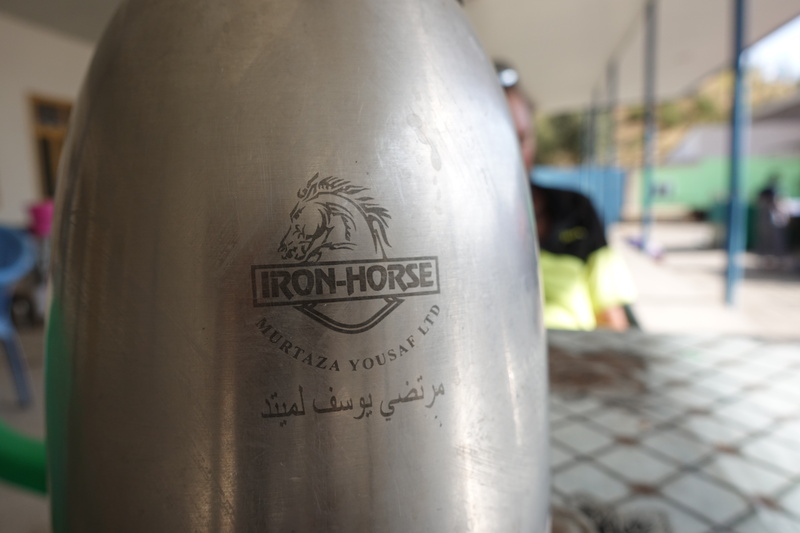 We’ll gladly accept things from passing strangers – especially when it’s a precious product like safe drinking water! 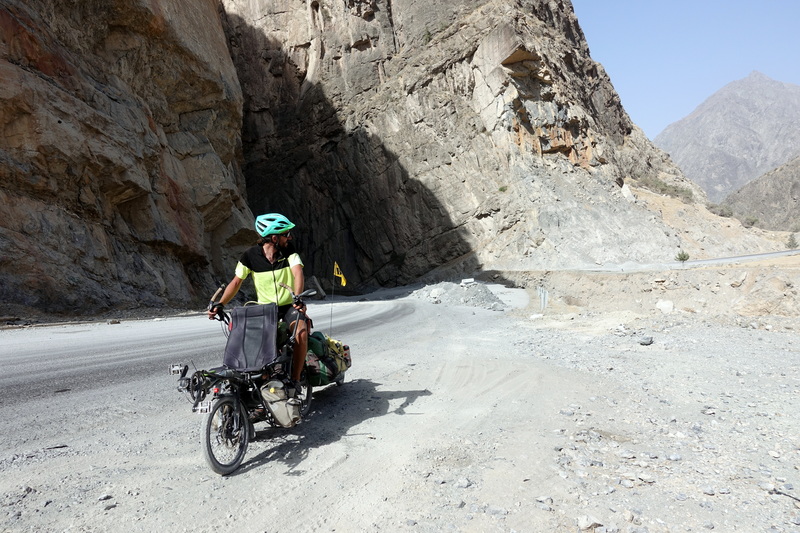 The ride down the Panj river was again a completely different landscape now, with a deep canyon and the road winding of its side at any possible place large enough to carve a two-lane track in its side. 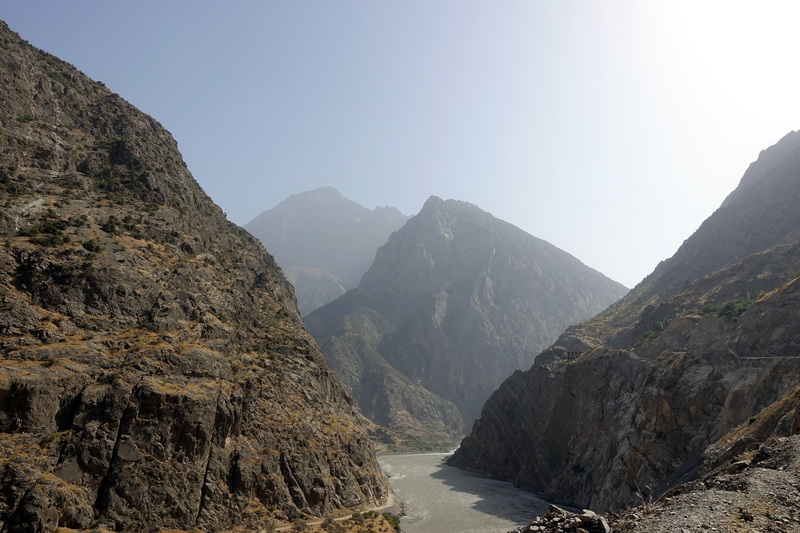 The valleys are barren, and rivers abruptly cascade thousands of meters over a few kilometers down into the main canyon. This creates even more remote side valleys and canyons, with often improbable villages at the junction but only on the Afghanistan side. 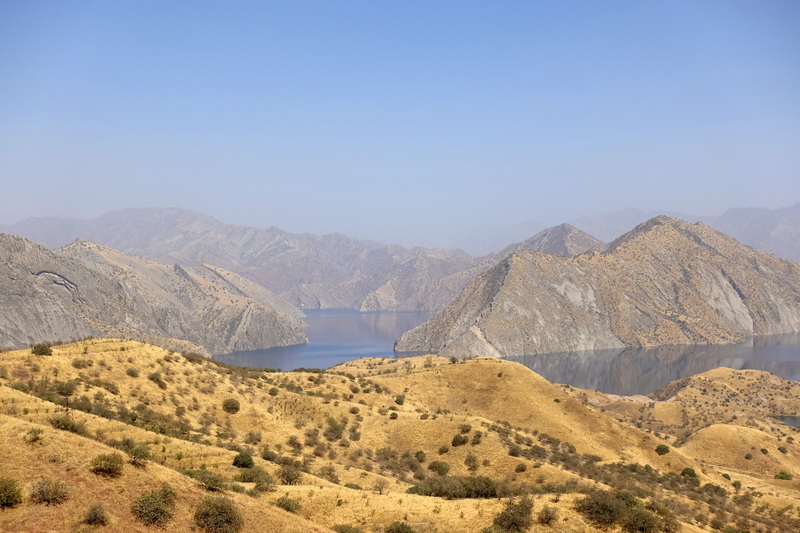 The Tajik side is a lot emptier, with only a few larger towns but at a much higher distance from each other. 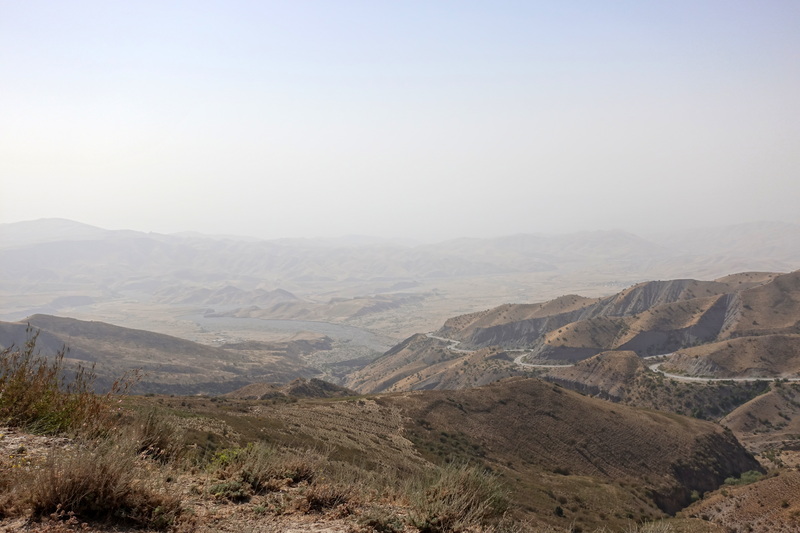 So yet again, we were riding in Tajikistan, but spending the day staring at Afghanistan. 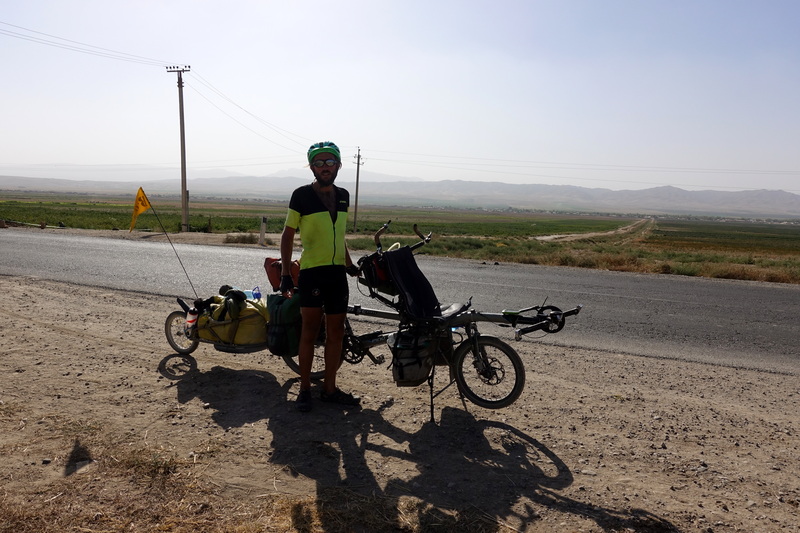 We cycled onward, looking for the next village to camp next to when a Tajik guy told us not to camp near the river, making a machine gun gesture (OK, OK, we understand that Afghanistan is unsafe). It turns out that there had been some shootings in the area from the Afghan side with a Tajik/Russian air force retaliation, plus Afghanistan is in the electoral period (at high risk in this corner of the planet) and the security forces just remain continuously in alert in this region. We prefer good roads, though (look beyond the sign). 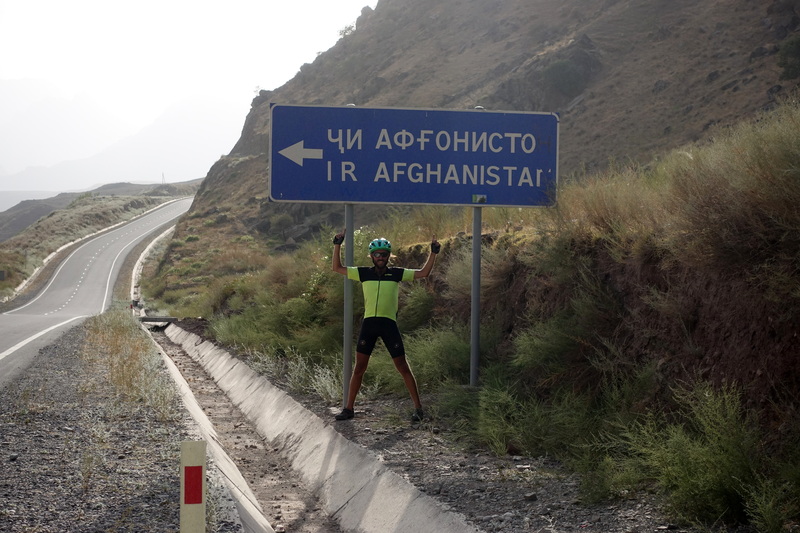 We stayed reasonable here and did not turn left (that would have been meant towards Kunduz and a few Taliban strongholds on the way!) – this border is very very quiet, if not closed. Looking around, the only seemingly good place to camp was the restaurant nearby. When we approached and asked about sleeping, the two women working the place welcomed us into the restaurant. Any place can become a hotel in a wink in here. Once we had our evening meal and took a bucket shower on the side of the house, we settled in for the night. One other man also appeared to be staying for the night and had taken a great interest in Cédric and his phone- particularly its photo taking capabilities. For the first five minutes, we were amused that he wanted to take pictures with us, but when he wanted us to pose with everyone and everything, it quickly became a nuisance and we put the phone away. He also asked to see all of the videos and pictures stored on the phone – which invades any sense of privacy and was starting to be simply seriously annoying. We would have told him to leave us in peace in Western countries, but in that remote corner of Central Asia it could be harder to explain and could have us be kicked-out of our shelter. But every time Cédric so much as glanced at his phone, the man would inch uncomfortably close to him, even if he was sitting on the other side of the room. We weren’t too sure if that was a cultural thing, until a group of local ladies having dinner also seemed to laugh at him… we had just earned the prize of have to deal with the local dummy (but probably related to the owners, therefore harder to get rid of him). As we pulled the mattresses out for sleeping, it seemed like the two ladies working in the restaurant would also be sleeping there as well. So there we were, all five of us, sleeping on the floor of a restaurant. We eagerly departed the next day, having become more than slightly annoyed that restaurant man seemed to dictate how long everyone could sleep. He was restless during the night, loudly sighing, signally to everyone that he couldn’t sleep. In the morning, he awoke at sunrise (earlier than 6am) and loudly declared to everyone in the room that he’s awake, playing with his ringtones (great prayers in midi format) and requesting breakfast (I don’t know Tajik, so I don’t know exactly what he said, but soon after he said something, the women grudgingly got up and started getting ready for the day). As we left the restaurant a few hours later, restaurant man was calmly snoozing in the corner, having been fed his breakfast. It looked like we had officially left the Pamirs and with its egalitarian communities to be back in the lower altitude where men acted like little princes. 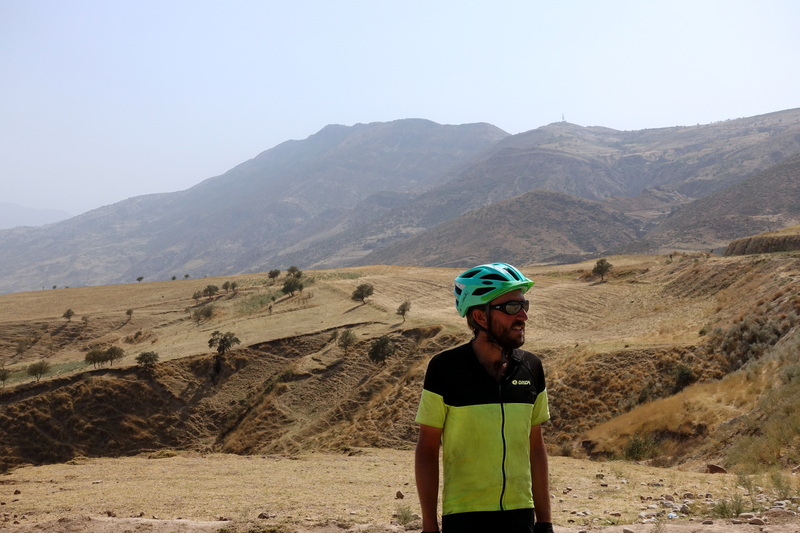 Shortly after Cédric and I started cycling, we parted ways with the Panj river and started a long ascent to get out of the valley. This deep into the valley, the skies were completely hazy with dust and the mountains were no longer jagged. 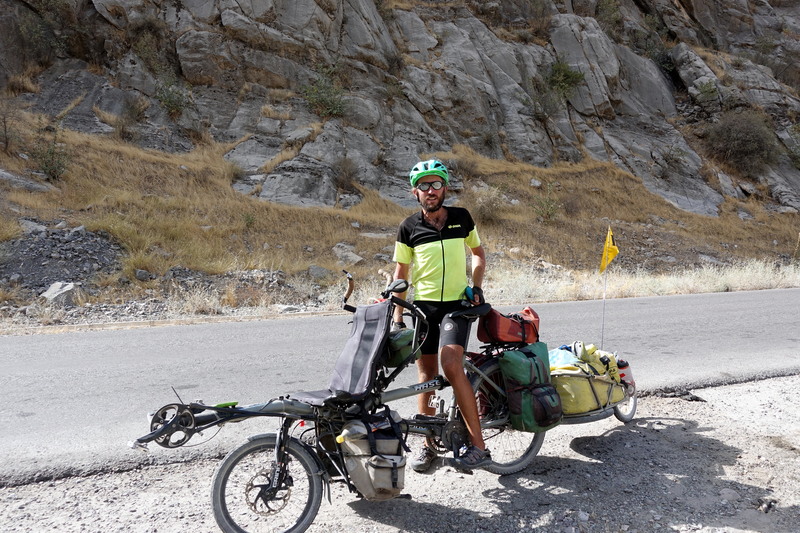 We were slowly leaving the higher mountains, but the way to Dushanbe is still not an easy ride: 4000m elevation and a few passes, with the first one bringing us back from under 1000m to over 2000m. 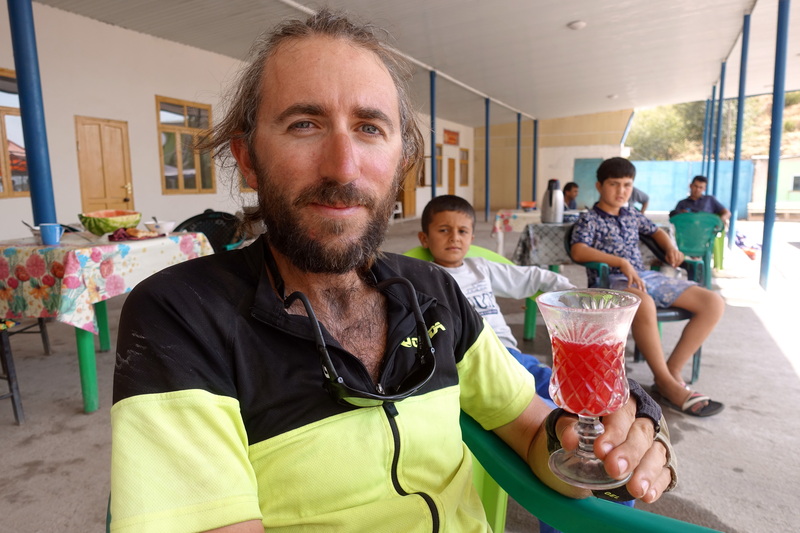 We finished the 1000+ meter climb near Shuro-obod having emptied all our bottles (temperatures had increased significantly as we descended) and stopped in the town to find something to eat. Since it was Friday and it seemed that the mosque had just let out, the whole town was roaming about and taking great interest in our presence. A few guys asked in decent English what we were looking for, a restaurant, and then guided us around the town with more of their friends joining the parade. Quickly, we were apprehended by a highly decorated ‘general,’ drunk, who excitedly took us to the nearest shop and declared that we could buy anything that we wanted. Half hoping that it was also an invitation to buy us our food, I was disappointed to hand over the Tajik somoni for a Coke, Snickers, and bread. 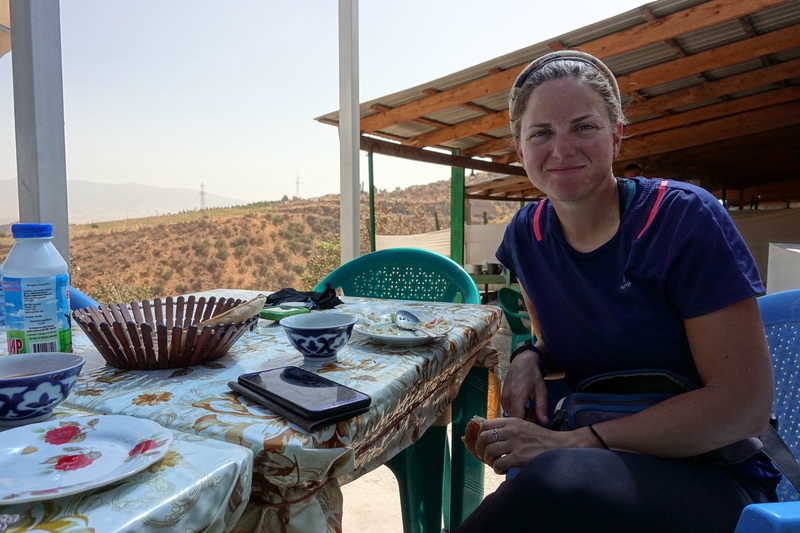 We hurriedly ate our sugar-fulled lunch because the men in the village surrounded us and wanted to constantly talk, so we left and rode downhill to Kulob. 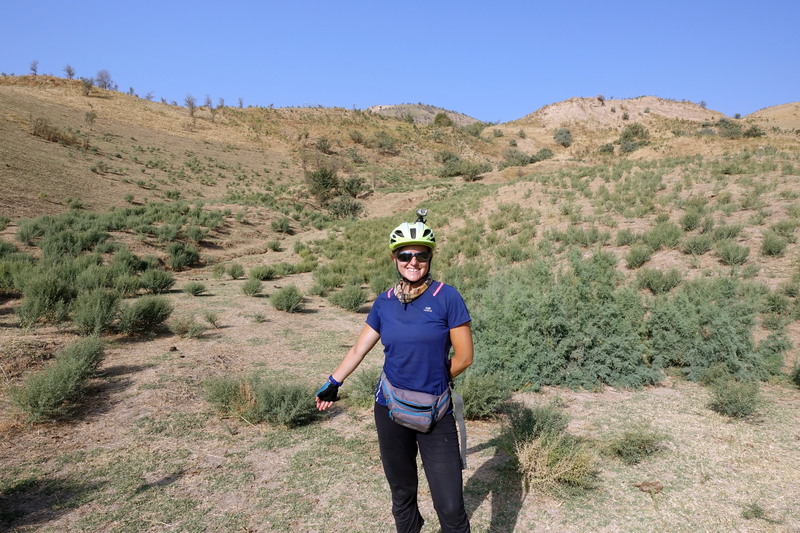 Now, we were definitely out of the Pamirs because the landscape transformed into large, rolling hills covered in dry grass. The afternoon haze didn’t make the landscape desirable. 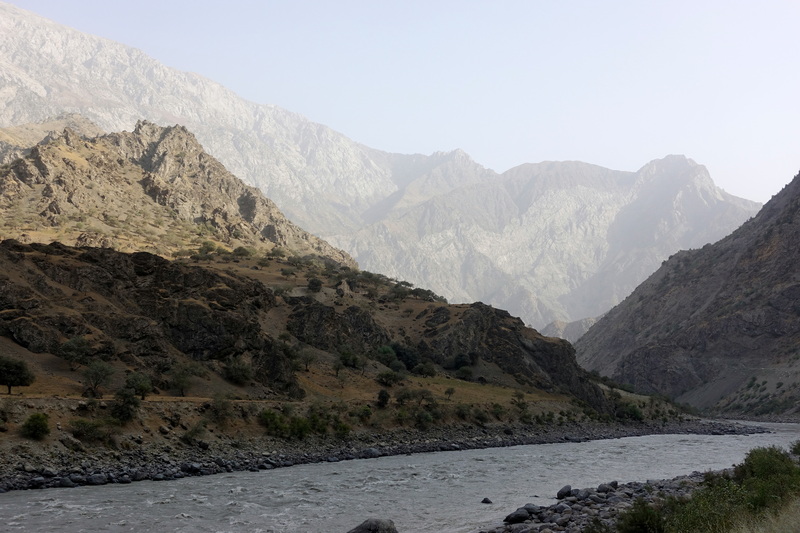 Saying goodbye to the Panj river valley, but we’ll meet it again in Uzbekistan under the name of the Amu-Darya. 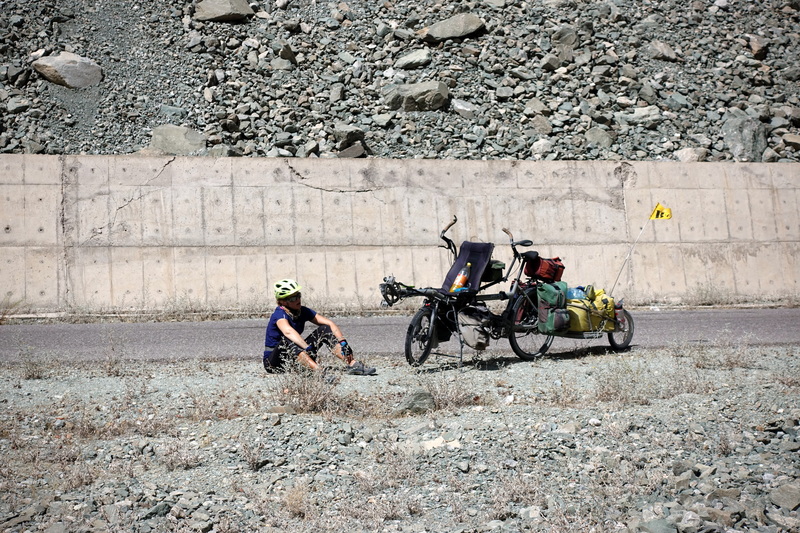 We are outside of the Pamirs, but it still does not mean that the roads are flat: 4500m elevation and three passes on the way to Dushanbe. Surprise! 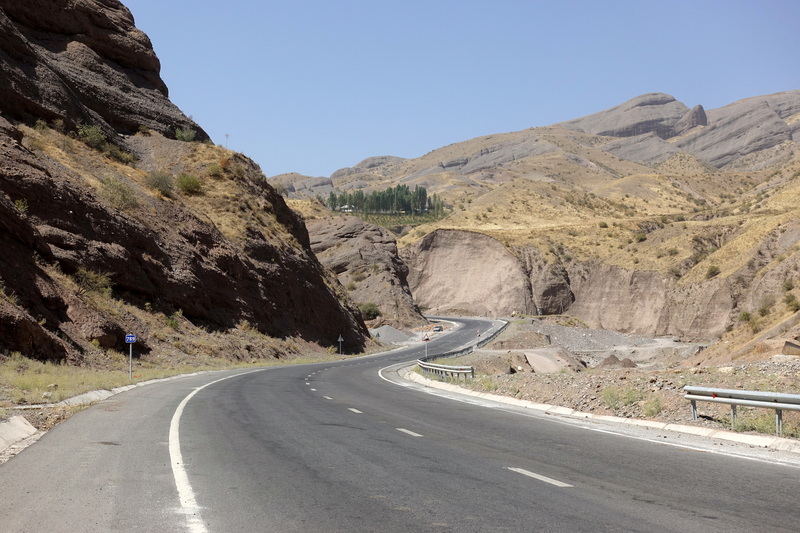 Never trust a good road in Tajikistan. 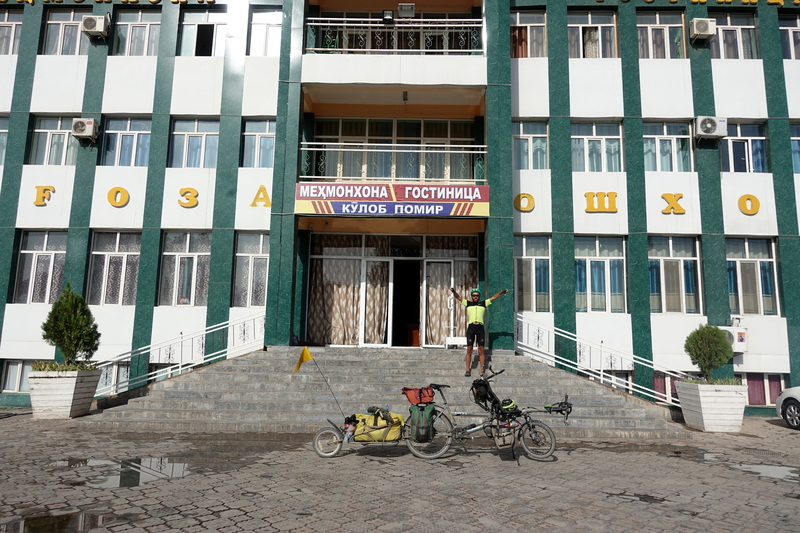 Once in Kulob, we rode to the nearest open hotel (after the first hotel told us that they were open, but oops, no, wait, they’re actually closed). Our hotel for the night, complete with a 24-hour buffet restaurant on the first floor, had curious plumbing. To flush the toilet, we had to first open a PVC valve to let water into the tank, and the room’s hot water heater started leaking conveniently (until the entire bathroom floor looked correctly like a bathtub) right before we went to bed – necessitating us to play with more valves on the wall of the bathroom. It seemed as though the room above us also had water issues because the ceiling sprung a serious leak at 5am… Another night of questionable sleep. The next morning, we packed our things and headed north. In this region, cycling along the road is less scenic than the previous few weeks. 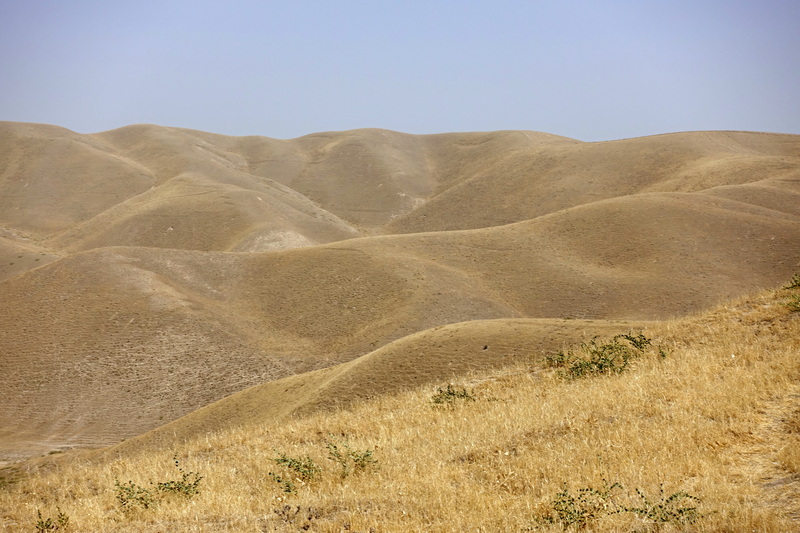 The haze obscured our view of mountains in the distance and the dry, golden hills looked both mesmerizing and depressing at this time of year. The crops were all harvested, leaving not much more than a dust bowl. Once we left Kulob, the traffic increased noticeably and most of the cars were secondhand Opel Astras. In Central Asia, you can almost tell which region you’re in just by the passing cars – Kyrgyzstan had decades old Audis and Mercedes, Japanese cars (still with right-side driver seat), and Daewoo Ticos near Osh, the Pamirs were littered with old Ladas or Toyota Land Cruisers (some suspiciously expensive-looking for the area), and now this area was an invasion of Opel. 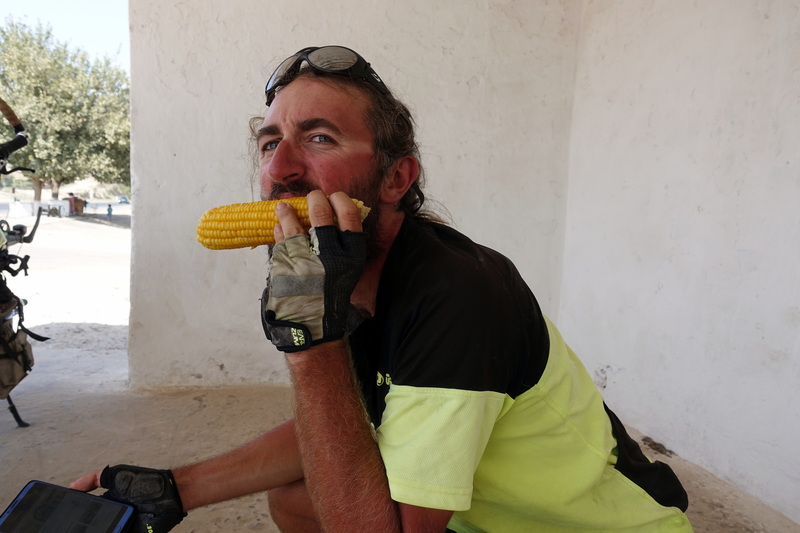 For lunch, we stopped in a small village to eat lunch, seeking shelter in an old bus stop. The woman in the small shop next door seemed uninterested in making money off of us, but instead gave us an entire watermelon, bread, cooked ears of corn, and handfuls of crabapples. 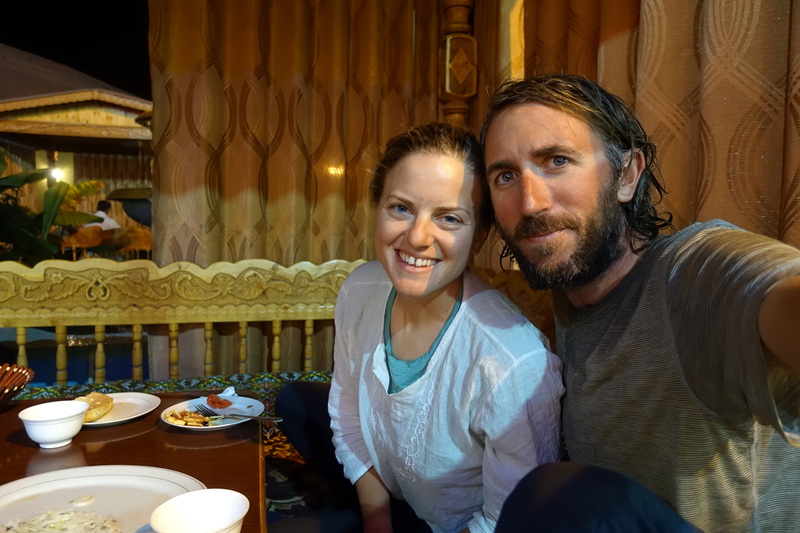 I guess we looked weary from our Pamir journey. 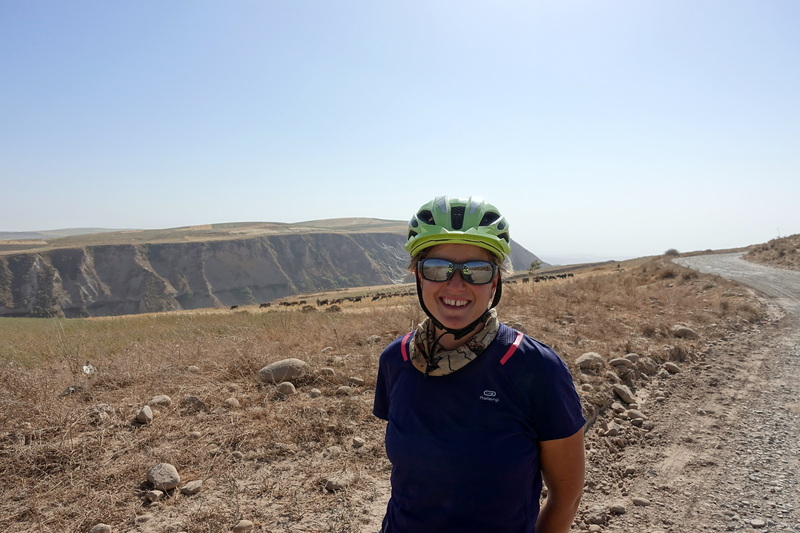 In the afternoon, we continued cycling through the hills and scattered villages, finally arriving in Danghara for the night. We didn’t have much choice for a hotel and chose the one that looked like it wouldn’t have plumbing issues. Kulob: came for some sleep, left with wet clothes. Don’t trust a shinny Tajik-Grand-Hotel, things may fall apart as soon as you’ve passed the reception. Gas stations – the only reliable place for shade. Note that the employee does not care a second and prefers to focus on his nap. Best deal ever, you buy a bottle of water and you get all types of produces from the valley for free! Bus-stops: the place to be offered food and get invited in Tajikistan. 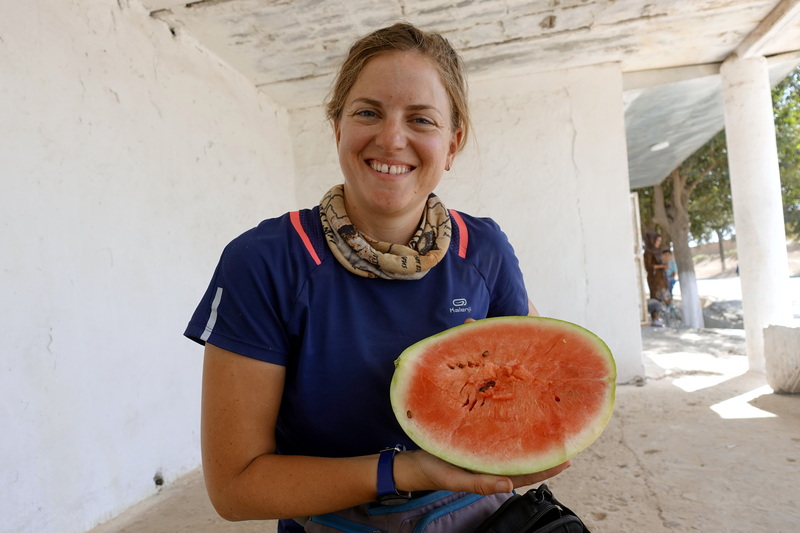 After eating 2/3 of the watermelon (probably around 10kg), we had to give the last part back to the shop because it would not fit on the trailer! The way to Danghara, a lot less scenic than the higher mountains. When we arrived, it took about 30 minutes to make sense of where we were supposed to sleep. First, although the building said ‘Hotel’ on the sign, the first floor was a restaurant, the second floor was a reception hall, and the third floor had rooms which were run by two older women. 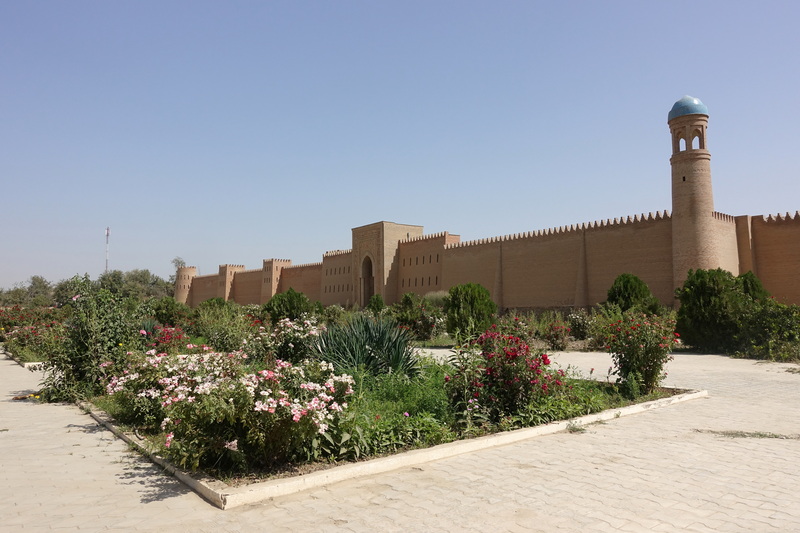 After having them bang on a room door, then having to wait a few minutes for two people (an army officer and his colorful friend) to emerge – it became apparent that this ‘hotel’ also operates by the minute. With a set of new sheets, we were finally allowed to bring our things into the room. The rest of the evening was spent eating greasy grilled kebabs and using the Google Translate app to talk some restaurant patrons. One guy, after learning that we were ‘Germans,’ commented “Aryans” into the phone. We weren’t sure if it was a mistranslation, so we asked him to again say something into the phone, “pureblood Aryans” is what it translated for us, followed by a “you are an Aryan, but me too, we are Aryans”. Ah yes, we uncomfortably acknowledged, that is what he meant. 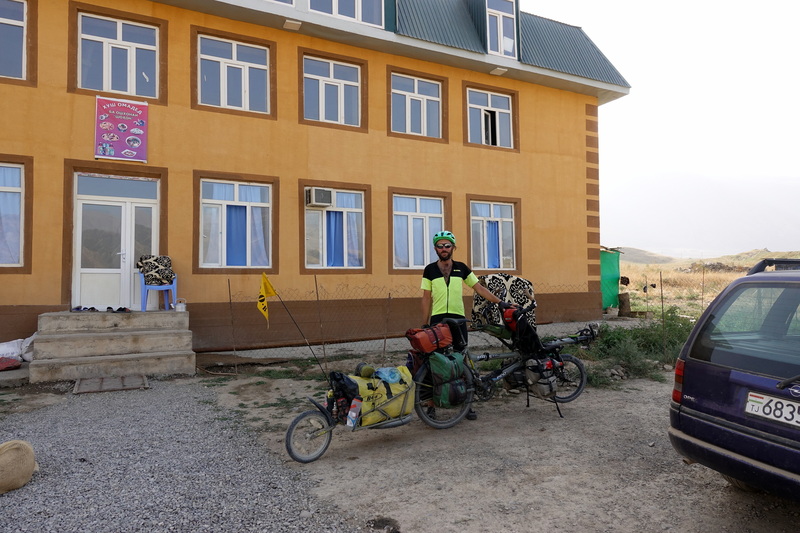 We awoke the next morning, eager to get on the road and reach Dushanbe. However, it was another day of climbing hills and battling traffic. Cédric and I were also aware that this area was where a group of cyclists were recently attacked by terrorists and that site of the attack was just down the road. Despite the recent tragedy, we chose to cycle this route for a few reasons, one being better road conditions and the other is risk assessment: we were still more likely to be hit by a car than attacked by a rogue group of young men, and it is not because something happened here that the risk of another attack has increased there more than anywhere else. 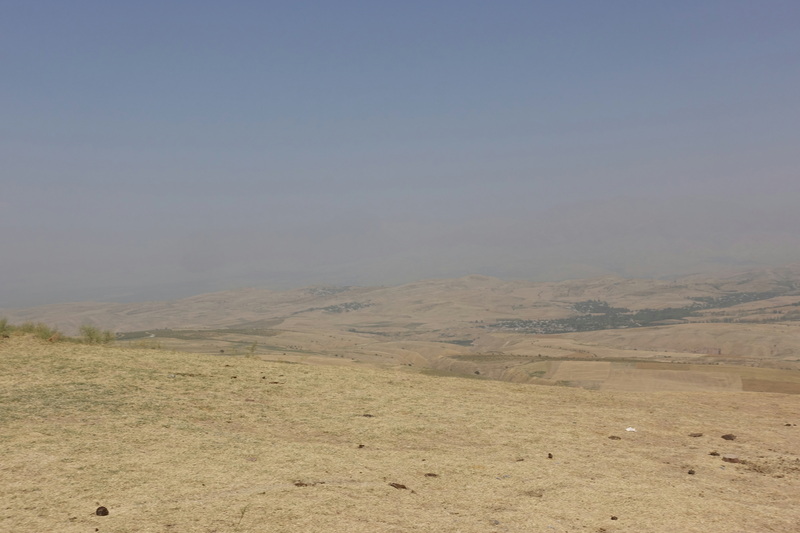 In the mid-morning, during the first leg of a long, 700-meter ascent, we came across the site of the attack. It was a somber moment for us as we got off the bike and looked at the memorial, especially knowing how close these cyclists were to the comforts of a big city and a proper hotel. 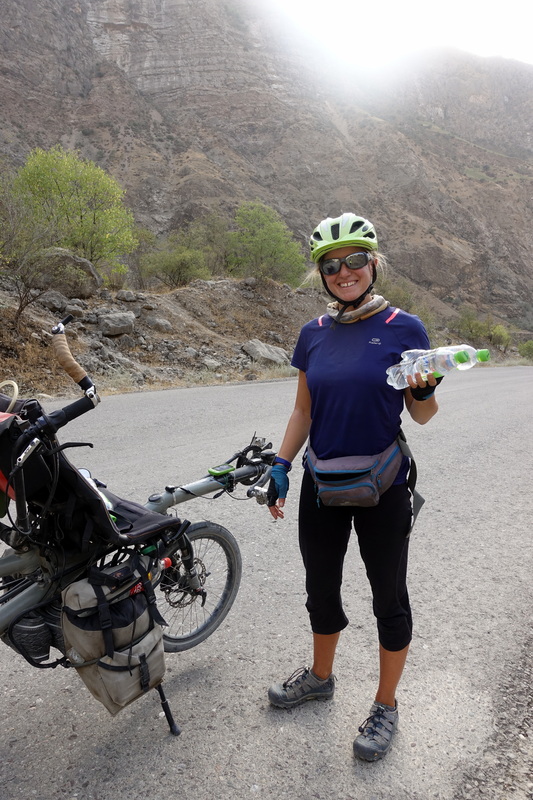 The place where the attack happened was a logical place for a cyclist to stop, rest, and drink some water, since most of the road’s shoulder consisted of a drainage ditch. It felt unfair to know that these lives were so violently taken when they were simply cycling. 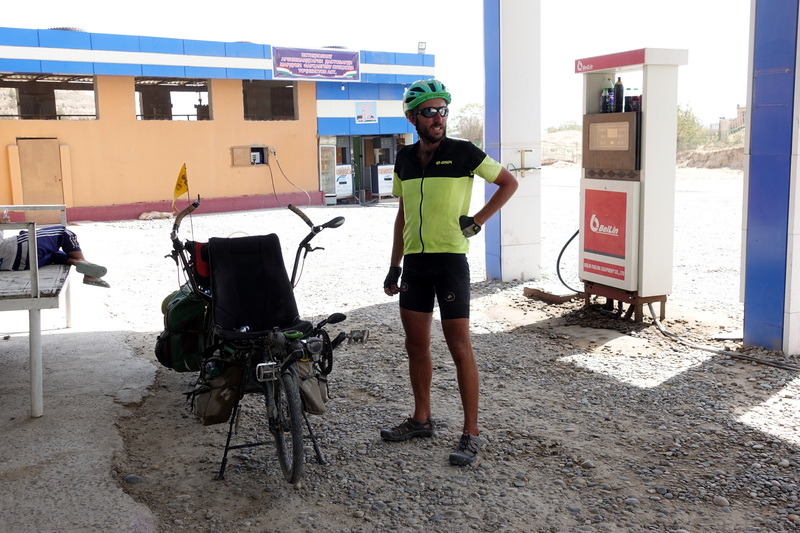 When we cycled into the next village and stopped for refreshments, the shop owner also reminded us of the attack, miming the whole scenario. ‘Too soon, man,’ I thought. 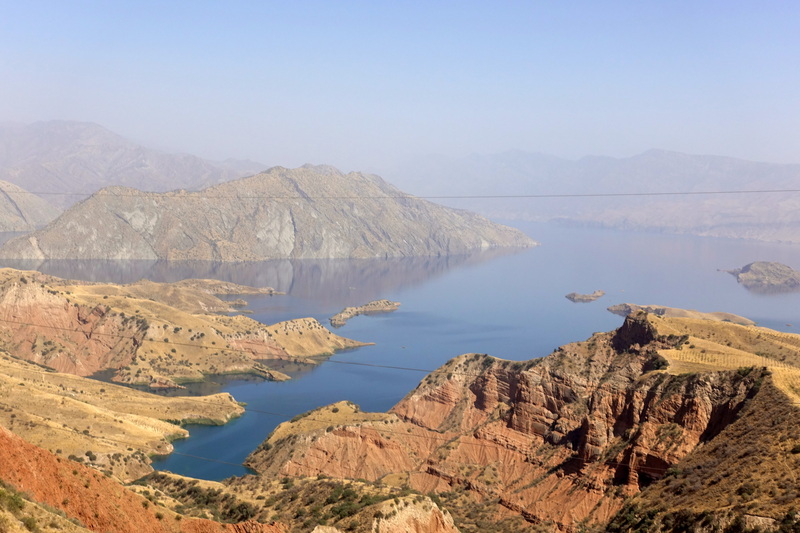 After our pitstop, we cycled up to the Vakhsh reservoir, a welcomed change in scenery to the barren hills before. The air was still hazy, but at least we could gaze onto the blue lake below. Near the top of the climb, we stopped for lunch at some roadside stands and prepared for our first trip through a tunnel on the way down to the reservoir. Luckily this is a Chinese made project (a reference in Central Asia! ), so it had functioning ventilation and lights. 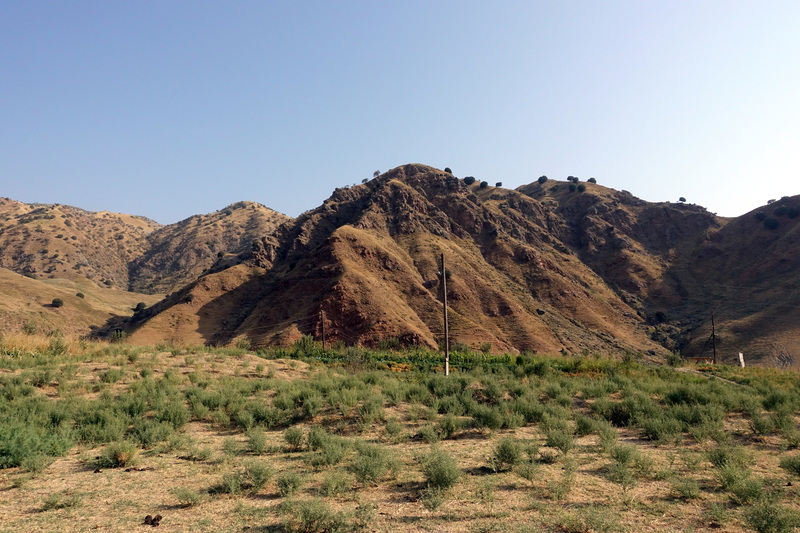 Towards the end of the day, we found a nice camp spot on the hills overlooking the road to Dushanbe. 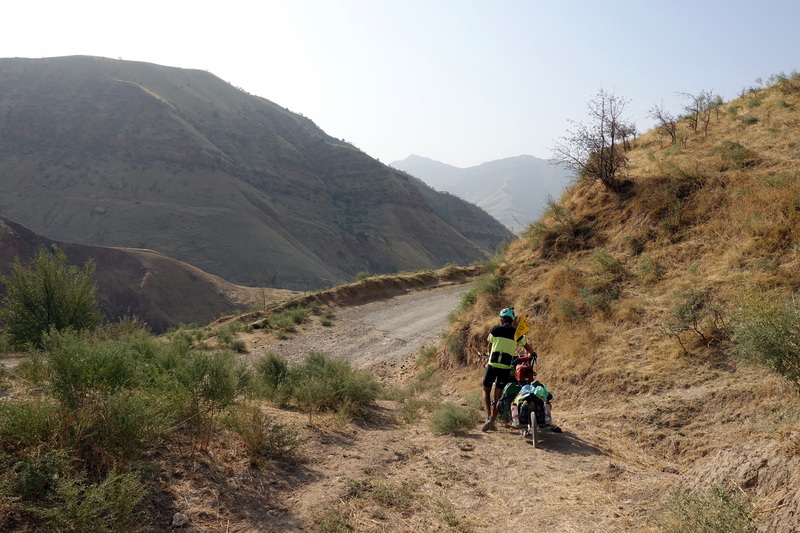 The next morning, we woke up eager to get to the city and finish the last climb in Tajikistan. With a slow pace, we spent a few hours nearing the top of the pass. However, the last five kilometers required yet another transit through a tunnel. So no one is worried, Cédric and I are prepared with multiple high-powered lights with various strobe and blinking effects – it’s hard not to see our moving rave party from a distance, and since the arrangement is so bizarre (we put some strong white lights at maximum brightness towards the back, so that drivers believe someone is driving in the wrong direction! And suddenly everyone drives slower and leaves a lot of space…), we succeed in getting drivers to slow down and pay attention to us. 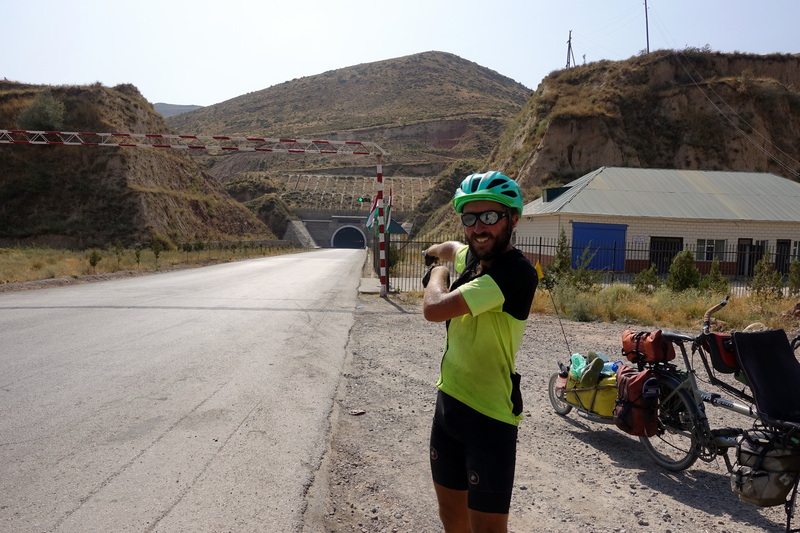 After we emerged from the tunnel, the road to Dushanbe was mostly downhill. The sky was still a golden haze, so we could barely see any of the surrounding mountains if farther than a few kilometers. As we rode on, our path transitioned from rural, rolling roads dotted with produce sellers to a multi-lane highway flanked by gas stations. 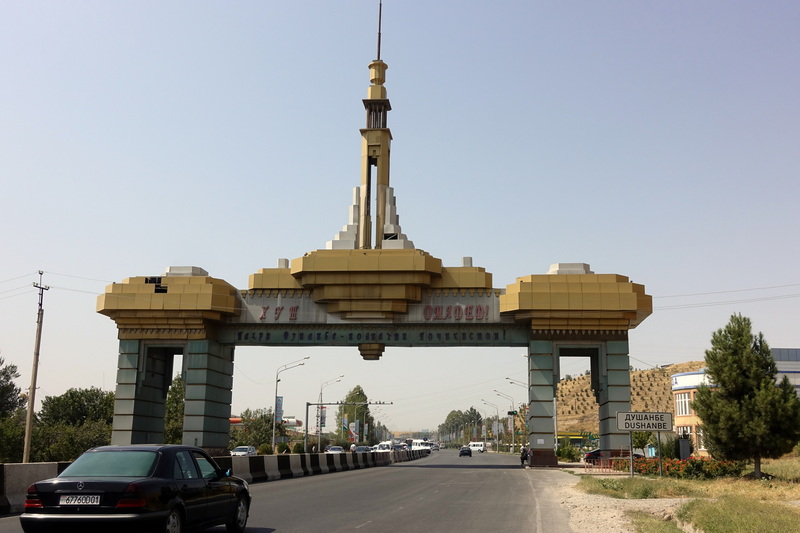 The closer to Dushanbe we got, the more I took on the role of traffic cop. Since most Central Asian drivers are erratic, I would honk, shout, put my hand up, and make all types of gestures to let the cars know that we had the right of way and where we intended to turn. 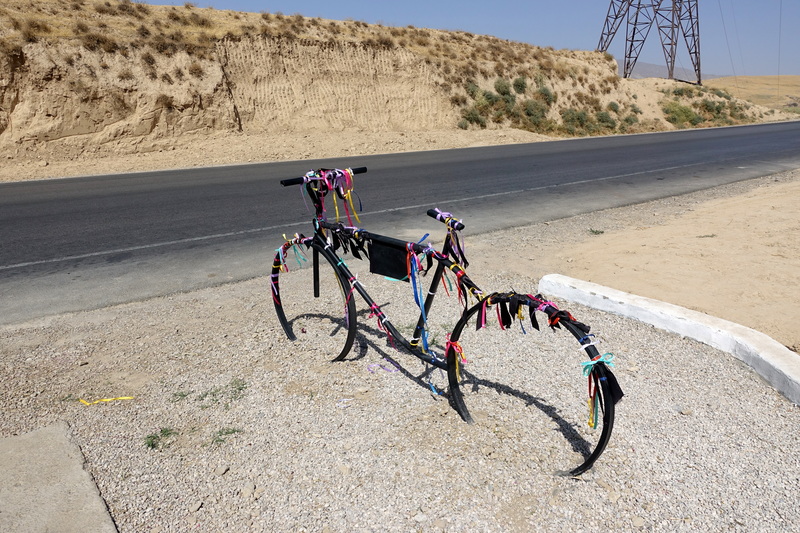 That plus angry looks from a weird bike works relatively well to organize the traffic, possibly better than the Tajik road patrol methods! 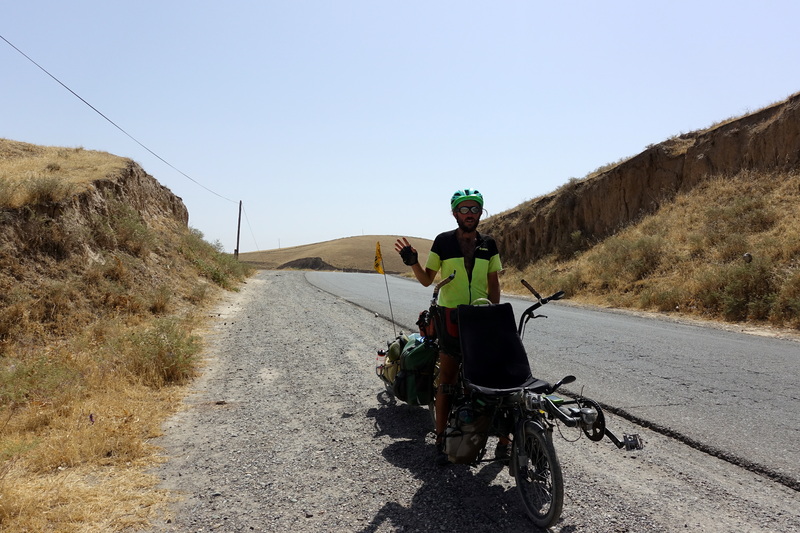 Negotiating the traffic for several kilometers, we finally arrived at our hotel in Dushanbe. A nice flat piece of ground among the hills! Thanks for the hints, openstreetmap! We just made it through the tunnel! Part of the world at the same time perilous and captivating. I guess the sight of the bikers’ monument was a very emotional moment. Another big stage in your storyboard. Maybe you should! There’s definitely a possibility to travel in more confort around the Pamirs with SUVs, possibly flights and with the help of car going from better hotels to better hotels. Cycling is better though!